Note: You can enter this giveaway one (1) time per e-mail address per day. Deadline is 11:59PM ET 3.1.19. Turn your kitchen into a French pastry school with this wonderfully accessible cookbook. 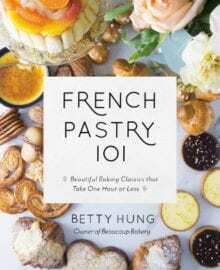 Stock up on butter, get out your rolling pin, and learn French pastry basics with Yummy Workshop blogger and co-owner of Beaucoup Bakery, Betty Hung. Delicate vanilla madeleines, rich chocolate ganache tarts, decadent hazelnut pralinés, indulgent crème brûlée, all made in your own kitchen. Get started with these simple brown butter financiers, with their velvety crumb and nutty flavor, their guaranteed to become a new favorite. NO PURCHASE NECESSARY TO ENTER OR WIN. Void where prohibited by law. Open to legal residents of the 50 U.S., D.C. and Canada (excluding Quebec) who are at least eighteen years old at the time of entry and have internet access. Begins on 2.8.19 at 12:00 a.m. ET and ends on 3.1.19 at 11:59 p.m. ET. To enter this giveaway, submit your full name and email address on this form. Odds of winning this giveaway depend on the total number of eligible entries received. Only one (1) entry per email address per day. Sponsored by Leite’s Culinaria, Inc. For more information, visit our Official Rules. For a list of winners, check out our Very Happy Winners page. Be sure to add giveaways@leitesculinaria.com to ensure notification if you are the winner.